The pink bunny statue at Lake Como will be replaced. The statue is a tribute to Chase Smith, Orlando City Commissioner Patty Sheehan’s longtime assistant who died in August of 2013 at the age of 41. 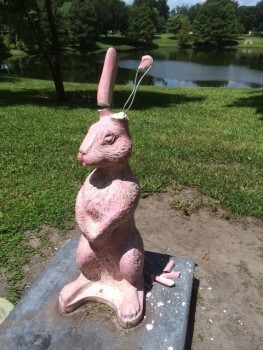 Sheehan installed two pink bunnies – one each in Langford Park and Lake Como park – in 2014 in memory of Smith, who loved to play the Easter Bunny at egg hunts held annually in those parks. The Lake Como statue was vandalized early morning Aug. 11, when someone smashed off the bunny’s ears. “They must have used a sledgehammer or bat, since the bunny is made of reinforced cement,” said Sheehan’s current assistant, Bill Stevens, in an email to Watermark. There is enough donated money leftover in Smith’s memorial fund to replace the statue, and Stevens says that order has been placed. He says they have also filed a report with the Orlando Police Department.